Keep your glass and mirrors sparkling and shining with this blue, 15" x 15" microfiber glass polishing cloth. The microfiber cloth material is gentle on delicate surfaces and can be used for tasks such as glass polishing, as it won't cause scratching. This glass cloth is highly absorbent and helps to wipe away dust without leaving behind lint or streaks. I love these because they are so versatile! They're super soft and will get windows and glass clean as well as any counters or services that need cleaned. I highly recommend them they come in multiple colors so you don't cross contaminate. These towels are awesome for drying glasses. They are absorbent and soft and leave no lint behind. They dry quickly. I can't believe what a difference this towel makes. Worth every penny. The polishing cloth was very easy to use. I use it with my stainless steel cleaner to clean my chaffing dishes. You don't have to put too much pressure while cleaning. It cleans very well without any residues left. Will be ordering more soon. These work great for polishing glasses as well as cleaning tables without leaving little drip residue on the tables that has to dry. Just wipe and it is ready to seat more people. These cloths are perfect for cleaning glass, stainless steel (or any other metal), and even glasses. These are larger than I expected for the price and work really well! Great microfiber cloth for polishing all glassware. Does not leave lint on dishware which is great. Does not shrink when washed. Good value for pricing. The 15" x 15" blue microfiber glass polishing cloth is a great buy and very good price for a twelve pack. Terrific for cleaning windows and helps get smudges off our display glass. The Blue Microfiber Glass / Fine Polishing Cloths are the only cloths I will ever use to polish my glassware. They are very good and get rid of all marks and scuffs. This has a great smooth surface and gives a streak free shine which is non scratchy. The house cleaning crew who comes to my house loves it. The perfectly smooth and soft finish on this cloth is a perfect way to polish and clean up your dishes and silverware. It also makes a good eye glass cloth. The 15x15 Blue Microfiber Polishing cloth is true to its name and is an excellent value microfiber perfect for polishing glassware or cleaning a class window. I'd say its better suites toward polishing than cleaning but it can handle both quite well. The value is outstanding. Its manufactured by some generic brand called Knuckle Buster. Overall excellent item and very useful. Hate these rags. We purchased these to see how they do at polishing flatware. They don't work very well in that category. Huge negative, if your hands arent perfectly manicured and smooth, these will grab on to your hands like glue. So annoying. We started using them to polish other things but I remain unimpressed. This polishing towel is very fine, and lint free! It does a great job and works well on polishing my deep red wine glasses. I know my bar and restaurant customers appreciate the spotless glasses that this towel provides. I did cut mine while opening my box, so be careful, but I am happy to say that the cut has not increased in size, and it is still going strong! These 15in by 15 in microfiber cloths work great on glass. they wipe off well and leave it streak free no smudges. They are thick and excellent quality. This cloth has a variety done uses such as polishing glass or silver. I like to use it to remove water stains from my utensils. Excellent microfiber cloth that is thick and durable and can be used to clean any glass surface, even devices like tablets and cell phones. Great buy! When I need glass display surfaces to be clear, I grab this blue cloth. It quickly takes away unwanted finger prints so that the surface sparkles and gleams. Works well for glasses and for mirrors, though be aware it doesn't get rid of dried smears and smudges, you have to wash and dampen the surface first but then it does seem to get rid of streaks and smudges! This is my go-to cloth for cleaning car windows. I always keep one in the car in case I go through the car wash...No more water spots! Does a great job removing smears, scuffs, and watermarks on all the glasses we use for our beer. Nobody likes a dirty glass full of beer! We have several of these microfiber fine polishing cloths and always use them before every event to help prepare our flatware in glassware for service. These are a must when you are producing a fine dining event and want to ensure there are no smudges or fingerprints on your serve ware. These blue microfiber cloths are perfect for polishing glasses. simply steam the glass until condensation forms, and use the towel to polish without leaving streaks. 15" x 15" Blue Microfiber Glass / Fine Polishing Cloth I love these for cleaning Windows or to clean wood surfaces. Highly recommended if you don't want streaky widows when you clean. Great polishing and cleaning cloth. We use them almost exclusively for cleaning and polishing glasses. They are easy to clean and leave no streaks on glass or stainless. This microfiber cloth is so soft and perfect for removing fingerprints from windows. Doesn't leave behind any streaks at all. My windows look brand new again. love this towel. cleans well on window and mirrors. its perfect for ocd.. it gets the job done super well. will order again because its a great price. Great polishing cloth! This is my go to whenever I'm cleaning mirrors around the house. Good quality and a good price, works well. Zero complaints! We love this fine texture of microfiber cloths to detail the glass in our vehicles. You can use them inside and out, just be sure to change rags often so you don’t scratch the glass from the dirt and debris you’re trapping. Also, be sure to get the special detergent for them when you wash them so that they remain lint free. 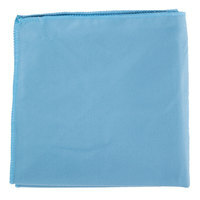 We use this blue polishing cloth to clean wine glasses of fingerprints and dust. Its so important to have a perfectly clean glass on the table for guests. Works great! Bought these for my cleaning lady and she absolutely loves them. She uses them for windows, our glass doors and mirrors. she compared them to the Norwex ones and likes them just as much but a far better price through webstaurant! We go through these like crazy!! Not because of poor construction but because they keep disappearing. Everyone is a fan!!! At such a great price too!! The 15" x 15" Blue Microfiber Glass / Fine Polishing Cloth definitely exceeded my expectations. The quality is great and the price is very reasonable. Highly recommend! These microfiber clothes work amazingly very well. I use them to clean glass windows and they absorb the water right away and leave a nice clean spotless window. Have a black ceramic stove top or something that always seems to end up streaky even after you've wiped it off multiple times? This is exactly what you need. It will take all of those smudges and streaks and make them disappear. We use them everyday in our restaurant. They're easily the best and cheapest option out there to keep your glasses looking sparkly, clean and smudgefree. I love everything about this microfiber cloth! It is great for cleaning up and comes fairly clean after a good wash. These have become a mainstay in my home and office for getting things fixed up! These work very well on my glass furniture and other instruments. I definitely recommend it! Excellent product and great to polish flatware and glassware. Really recommend it and plan to order again and really helpful to have for our restaurant. This microfiber polishing cloth is absolutely great. I have used it to clean my stainless steel fridge and worked wonders. It completely removed all dirty spots and dirty lines that other cloths couldn't. Great absorbent towels. I use these to polish gllassware and there are never any streaks. Sometimes I'll use this to wipe the bar as well. Sir Clean recommended 15" x 15" Blue Microfiber Glass / Fine Polishing Cloth, this microfiber is excellent to clean glass and mirrors, we use in our cleaning activities. This is a high quality polishing cloth. Withstands multiple washes and uses. I have yet to see a fray and they are light and easy to carry. These polishing cloths are great. Much cheaper than you get in a retail store and we have been washing them on a sanitizer cycle in the clothes washer for several months now and they look new. We use these towels to polish our glassware. They are great because they don't leave lint on the surface. They are blue and can be reused. I poured 1/4 cup of water in a bowl and the 15" x 15" Blue Microfiber Glass / Fine Polishing Cloth had no trouble soaking up the water. Pleasantly surprised at how well it worked. The Microfiber Glass Cloth is coming into great use in our store! We are constantly cleaning our windows to make sure our store is always clean for our customers. I am very, very please with the performance of these towels on mirrors, windows and other shiny surfaces. I did not realize how much of a difference in time that these towels make in the jobs I have done over the terry or cotton towels we have used in the past. These are just the best! These microfiber clothes are great for window cleaning. One clothe usually goes a long way. They do not leave any streaks behind. The windows look great afterwards. THESE TOWELS WORK WELL ON GLASS AND MIRRORS LEAVES A BRILLIANT SHINE AND STREAK FREE WITH NO LINT THIS TOWEL IS WHAT YOU NEED FOR QUALITY RESULTS. Excellent product. We use these daily to polish ALL of our glassware everyday. Machine wash separately to ensure long life. We also run an extra rinse cycle to ensure all soap is properly pulled out of the clothes. This cloth was designed to clean glass products, I however have found that it cleans electronics very well. I mostly use it to buff out thumbprints from electronics that have a high gloss. It's a good value for what it does. These are awesome! Shines glasses and silverware right up, removing water spots and making them look very professional. Wash well for continued usage. Highly recommended product. These microfiber glass polishing cloths are a great value. They work well on flat ware, glass ware, windows, counter tops and hard surfaces. We get a lot of use from them, and they don't leave lint. These are great for cleaning everything from electronic devices to glass to silver and anything in between. They leave no streaks, and more often than not - I'm able to use them without having to use any cleaning products. Gret rag. so soft. does not leave little fibers like others did. I use this with the scratch remover and clean & shine spray. works great on my food display. I love using these microfiber cloths on the windows and mirrors, it takes the stress out of making everything streak free, they wash well and seem like they will last a long time! Cloth does a really wonderful job cleaning. Doesn't leave any streaks or residue on the windows. Holds up well through multiple washes. Great overall product. This cloth works great. It cleans and polishes glass surfaces with no scratching, smearing or residue left behind. Our dishwasher never got our glasses so nice looking. All our glasses look new again! These do a great job cleaning all the items I purchased from this site. It removes all finger prints and shines up your metal items with ease. This works great. Does the job and is better than regular wipes because this cleans and polishes glass surfaces with no scratching, smearing or residue left behind. these are great to have in your restaurant. they are perfect for polishing glasses and even silverware. they are pretty inexpensive and do a great job! Great product. I like using these to polish the flatware. It really makes the flatware shine. Also great for cleaning glass and computer screens without using chemicals. I LOVE using this microfiber glass polishing cloth for polishing wine glasses and also water glasses. It leaves the glasses very clean, elegant, and shiny. These are great towels for all sorts of uses in and out of the kitchen. Great for polishing chafer units and a nice towel for drying a car or even washing windows. These microfiber cloths are great. The price is affordable and you don't have to use any harsh cleaners with them. You get a streak free finish with water. These are nice microfiber cloths that work well for polishing silverware!! They are absorbent but work nicely for cleaning windows and glass surfaces!! Great price for 12 towels! !